There is nothing like a flowering tree to add beauty and fragrance to your landscape or garden. Although the majority of well-known ornamental trees bloom in the spring--such as crabapples and dogwoods--there are some lesser-known trees that will wait to flower until early, middle or even late summer. Plant summer-flowering trees with spring bloomers in your landscape and you will be rewarded with beauty that lasts from March to September. The sweet bay magnolia is a tree native to the southeastern part of the United States. The tree begins to bloom in late June with fragrant white, cup-shaped flowers that have a slight lemony scent, and continues to bloom until late summer. The leaves are long and slender, with attractive silver undersides, and the berries of the tree are bright red. This fast-growing tree can reach heights of between 10 to over 60 feet tall. Some home gardeners plant the tree in containers for use as a patio tree, which limits the growth of the tree. 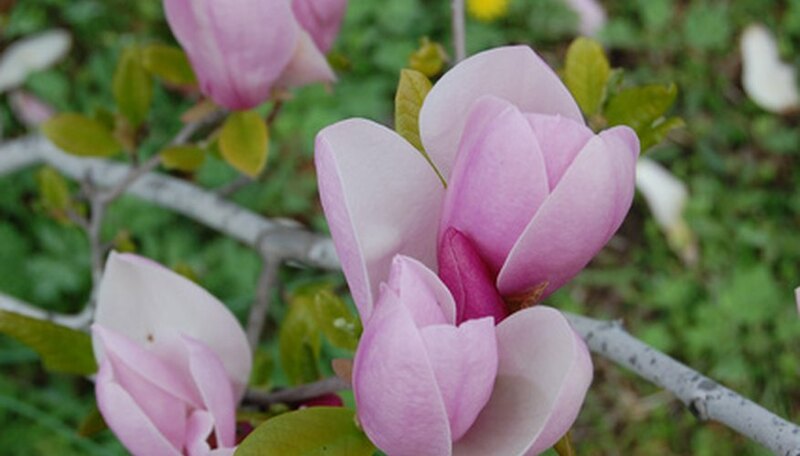 Sweet bay magnolias grow best in U.S. Department of Agriculture (USDA) hardiness zones 5 though 9. They grow equally well in sunlight or partial shade, and prefer cool, moist or even wet soil. Sourwood trees are often called "lily of the valley" trees for the white, scented flowers, which are shaped like those of the lily of the valley perennial. The sourwood tree is one of the few trees that bloom in late summer--from July to August in the United States. The bark of the sourwood tree is gray with an interestingly mottled texture, and the green leaves turn red, purple and orange in the fall. Sourwood trees are slow-growing, deciduous trees that thrive in USDA zones 6 through 9. These native, medium-sized trees can reach a maximum height of 30 feet and prefer a shady location with soil that is rich in organic matter. Goldenrains are excellent urban trees because of their hardiness. These flowering beauties are resistant to pollution and are drought tolerant. In late June, the tree blooms with sweet-smelling, vertical clusters of yellow flowers. The bark of the tree is rough, cracked and attractive. In the fall, the leaves turn yellow and orange. Goldenrains also produce large seed pods that can hang onto the tree providing winter interest. Goldenrain trees thrive in sunlight and can adapt to any type of soil, including salty soil. The blooms are most spectacular during hot, dry summers. Goldenrains grow well in USDA zones 5 through 9. They are rounded in shape and can be as large as 40 feet tall, with a maximum width of 35 feet.